With Azure Event Hubs, you can use Azure Stream Analytics to check the incoming data and pull out the anomalies, which you can then visualize in Power BI. Let's say you have thousands of devices constantly sending real-time data to an event hub, adding up to millions of events per second. How do you check that much data for anomalies, or errors, in the data? For example, what if the devices are sending credit card transactions, and you need to capture anywhere you have multiple transactions in multiple countries within a 5-second time interval? This could happen if someone steals credit cards and then uses them to purchase items around the globe at the same time. In this tutorial, you simulate this example. You run an application that creates and sends credit card transactions to an event hub. 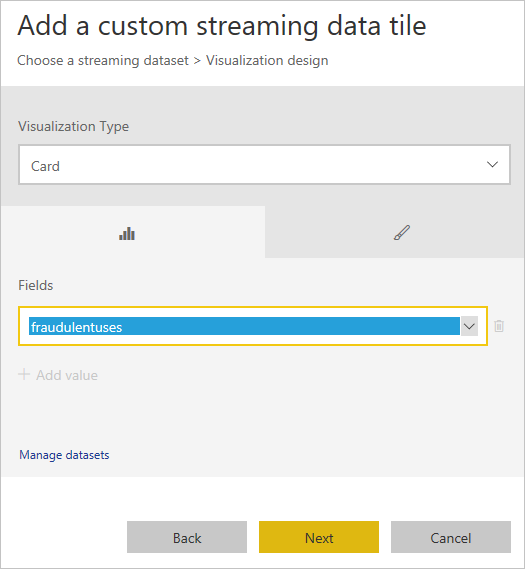 Then you read the stream of data in real-time with Azure Stream Analytics, which separates the valid transactions from the invalid transactions, and then use Power BI to visually identify the transactions that are tagged as invalid. To complete this tutorial, you need an Azure subscription. If you don't have one, create a free account before you begin. You need a Power BI account to analyze output from a Stream Analytics job. You can try Power BI for free. For this tutorial, you need an Event Hubs namespace and an event hub. You can create these resources using Azure CLI or Azure PowerShell. Use the same resource group and location for all of the resources. Then at the end, you can remove everything in one step by deleting the resource group. Create an Event Hubs namespace. There are variables set in each script that you need later in the tutorial. These include resource group name ($resourceGroup), event hub namespace ($eventHubNamespace), and event hub name ($eventHubName). These are referred to with their dollar sign ($) prefixes later in this article, so you know they were set in the script. Copy and paste this script into Cloud Shell. Assuming you are already logged in, it runs the script one line at a time. The variables that must be globally unique have $RANDOM concatenated to them. When the script is run and the variables are set, a random numeric string is generated and concatenated to the end of the fixed string, making it unique. # Set the values for location and resource group name. #   for all the resources for this tutorial. # The Event Hubs namespace name must be globally unique, so add a random number to the end. # Create the Event Hubs namespace. # The event hub name must be globally unique, so add a random number to the end. # Create the event hub. # Get the connection string that authenticates the app with the Event Hubs service. The variables that must be globally unique have $(Get-Random) concatenated to them. When the script is run and the variables are set, a random numeric string is generated and concatenated to the end of the fixed string, making it unique. # Log in to Azure account. # Set the values for the location and resource group. #   for all resources for this tutorial. # Get the event hub key, and retrieve the connection string from that object. # You need this to run the app that sends test messages to the event hub. # Save this value somewhere local for later use. Download the Azure Event Hubs samples from GitHub and unzip it locally. Go to the folder \azure-event-hubs-master\samples\DotNet\AnomalyDetector\ and double-click on AnomalyDetector.sln to open the solution in Visual Studio. Open Program.cs and replace Event Hubs connection string with the connection string you saved when running the script. Replace Event Hub name with your event hub name. Click F5 to run the application. It starts sending events to your event hub, and continues until it has sent 1000 events. There are a few instances where the app needs to be running for you to retrieve data. These cases are pointed out in the following instructions, where needed. Now you can stream data into your event hub. 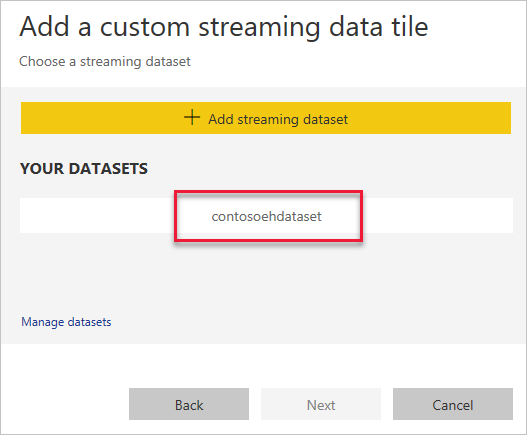 To use that data in a Power BI visualization, start by setting up a Stream Analytics job to retrieve the data that is then fed into the Power BI visualization. In the Azure portal, click Create a resource. Type stream analytics into the search box and press Enter. Select Stream Analytics Job. Click Create on the Stream Analytics job pane. Job name: Use contosoEHjob. This field is the name of the job and it must be globally unique. Resource group: Use the same resource group used by your event hub (ContosoResourcesEH). Location: Use the same location used in the setup script (West US). Accept the defaults for the rest of the fields. Click Create. If you're not in the portal at the Stream Analytics Job pane, you can get back to your Stream Analytics job by clicking Resource Groups in the portal, then selecting your resource group (ContosoResourcesEH). This action shows all of the resources in the group, and you can then select your stream analytics job. The inputs for the Steam Analytics job are the credit card transactions from the event hub. The values for variables starting with the dollar sign ($) are set in the startup scripts in the previous sections. You must use the same values here when specifying those fields, which are the Event Hubs namespace and event hub name. Under Job Topology, click Inputs. Input alias: Use contosoinputs. This field is the name of the input stream, used when defining the query for the data. Event Hubs namespace: Select your Event Hub namespace ($eventHubNamespace). Event Hub name: Click Use existing and select your event hub ($eventHubName). Event Hubs policy name: Select RootManageSharedAccessKey. Event Hubs consumer group: Leave this field blank to use the default consumer group. Accept the defaults for the rest of the fields. Under Job Topology, click Outputs. This field is the name of the output stream, used when defining the query for the data. Output alias: Use contosooutputs. This field is the unique alias for the output. Dataset name: Use contosoehdataset. This field is the name of the dataset to be used in Power BI. Table name: Use contosoehtable. This field is the name of the table to be used in Power BI. 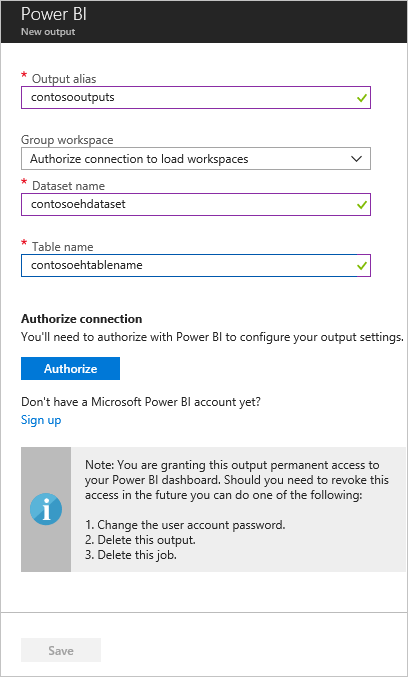 Click Authorize, and sign in to your Power BI account. 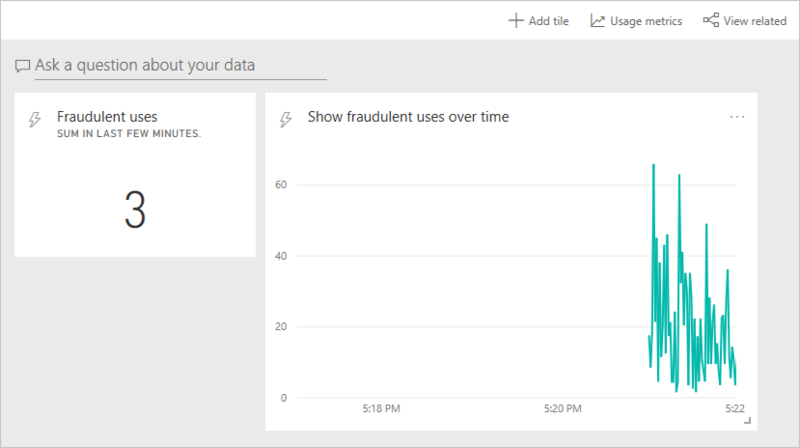 This query is used to retrieve the data that is ultimately sent to the Power BI visualization. It uses contosoinputs and contosooutputs, which you previously defined when setting up the job. This query retrieves the credit card transactions that it deems fraudulent, which are transactions in which the same credit card number has multiple transactions in different locations in the same five-second interval. Under Job Topology, click Query. Run the Anomaly Detector app to send data to the event hub while you're setting up and running the test. In the Query pane, click the dots next to the contosoinputs input, and then select Sample data from input. Specify that you want three minutes of data, then click OK. Wait until you're notified that the data has been sampled. Click Test and make sure you're getting results. Results are displayed in the Results section of the bottom pane on the right under the query. 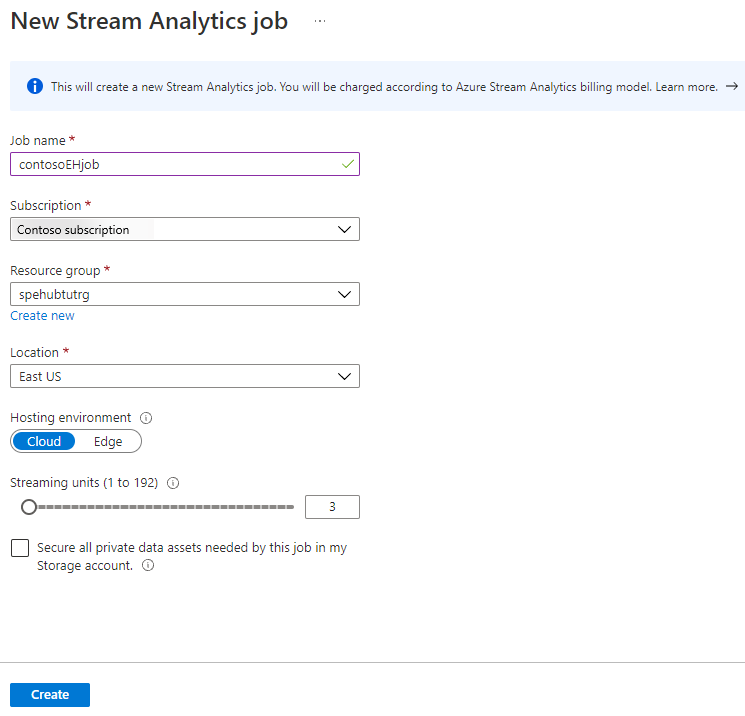 In the Stream Analytics job, click Start, then Now, then Start. Once the job successfully starts, the job status changes from Stopped to Running. Run the Anomaly Detector app to send data to the event hub while you're setting up the Power BI visualization. You may need to run it multiple times, as it only generates 1000 transactions each time it runs. Sign in to your Power BI account. You should see the dataset that you specified when you created the output for the Stream Analytics job (contosoehdataset). It may take 5-10 minutes for the dataset to appear for the first time. Click Dashboards, then click Create and select Dashboard. Specify the name of the dashboard, then click Create. Use Credit Card Anomalies. 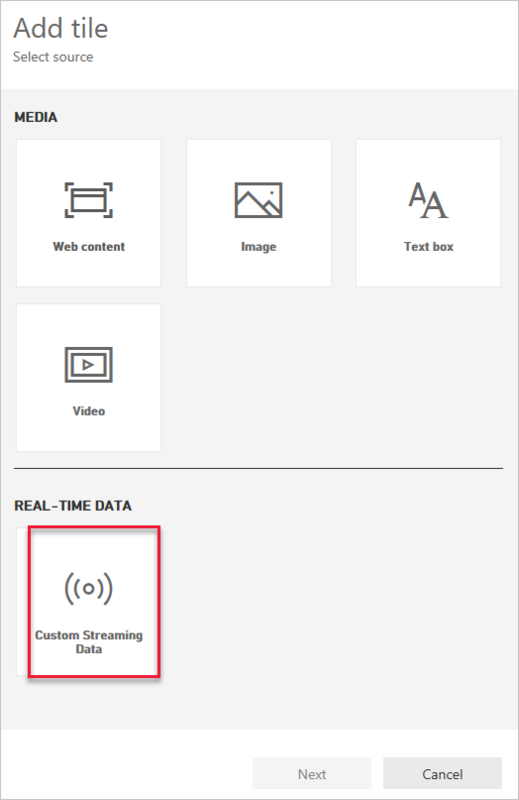 On the Dashboard page, click Add tile, select Custom Streaming Data in the REAL - TIME DATA section, then click Next. Select your dataset (contosoehdataset) and click Next. Select Card for visualization type. Under Fields, click Add value, then select fraudulentuses. Set the title to Fraudulent uses and the subtitle to Sum in last few minutes. Click Apply. It saves the tile to your dashboard. When you run the sample application and stream data to the event hub, the number on this tile changes rapidly (every second). It's because the Stream Analytics query actually updates the value every second. Update the query to a 3 minute tumbling window to see the sum in the last few minutes. Select your dataset and then click Next. Under Visualization Type, select Line chart. Under Axis, click Add Value, and select windowend. Under Values, click Add value and select fraudulentuses. Under Time window to display, select the last five minutes. Click Next. 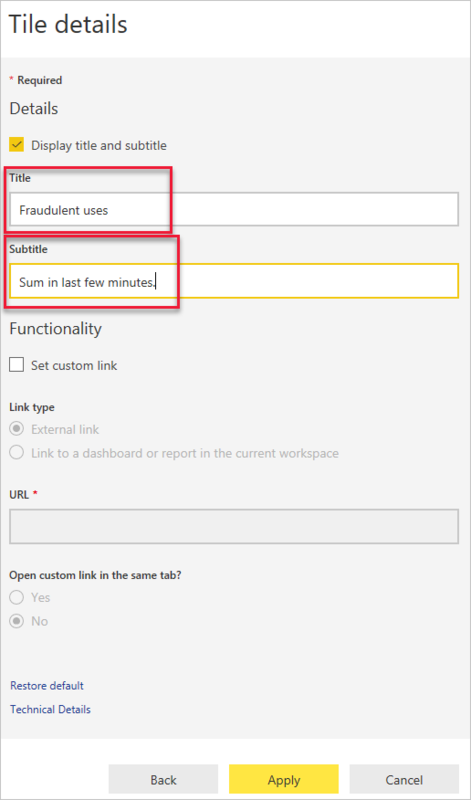 Specify Show fraudulent uses over time for the title and leave the subtitle for the tile blank, then click Apply. You are returned to your dashboard. Run the Anomaly Detector app again to send some data to the event hub. You see the Fraudulent uses tile change as it analyzes the data, and the line chart shows data. If you want to remove all of the resources you've created, remove the Power BI visualization data, then delete the resource group. Deleting the resource group deletes all resources contained within the group. In this case, it removes the event hub, Event Hub namespace, stream analytics job, and the resource group itself. 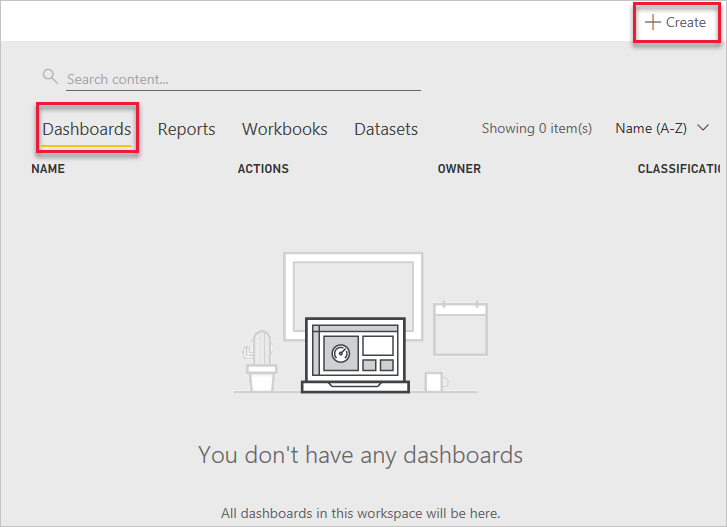 Log into your Power BI account. Go to My Workspace. On the line with your dashboard name, click the trash can icon. Next, go to DataSets and click the trash can icon to delete the dataset (contosoehdataset). To remove the resource group, use the az group delete command. To remove the resource group, use the Remove-AzResourceGroup command. Advance to the next article to learn more about Azure Event Hubs.